With grace of HH Sri Chinna Jeeyar Swamiji! Women health camp was conducted on 17/04/2015 at Karimnagar (bhagya nagar) with co-ordination with Chalmeda hospitals. 152 ladies attended the camp. VIA tests done for 86 ladies. Among them 2 ladies were referred to uterus surgery, no cases are referred for VIA positive. Dr.Haseem Ali, Dr.Ramesh , Dr.Srikanth and Dr. Sindhu contributed their valuable time services and about 20 internship doctors also rendered their time . 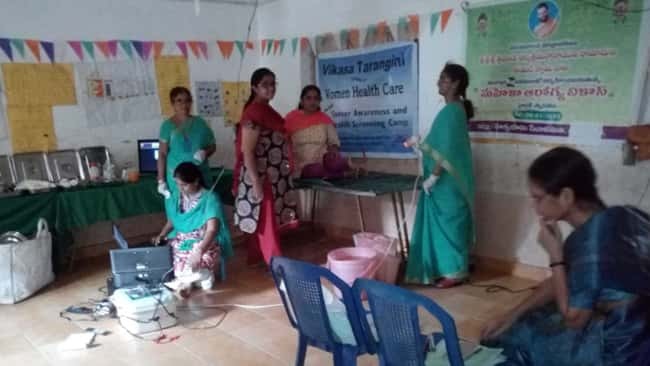 Vikasa Tarangini Karimnagar heads Sri K.Devender rao (EX MLA), Sri Ch.Ayodhyarama Rao,Sri M.Ashok Rao(women health camp in charge) and volunteers rendered their services. Mangalasasanams to you for the camp and good services you have done. Take follow up action also after those camps. Convey the same to all the doctors and volunteers, who helped you in conducting this camp.